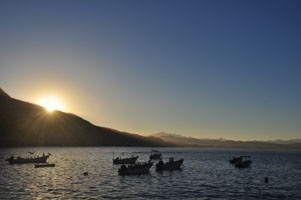 Just two hours south of Puerto Vallarta by car is the sleepy little fishing village of Tehuamixtle. Tehua, as it is known by locals, sits in a little cove surrounded by cliffs. The waters of Tehua Bay are clear and calm, with a gentle sand beach that is perfect for swimming. As you approach Tehuamixtle from the road above, winding down, you catch a first glimpse of this picture perfect place and realize that you are arriving at a very special place. Tehua is still a working fishing community. It is how they earn their living. You will see pangas, the flat bottom boats used for fishing, bobbing in the bay, along with a few sailboats and power boaters who have discovered this beautiful protected anchorage. In addition to fish, Tehua is well known for its oysters. People come to Tehua, just for the oysters. Several restaurants in Puerto Vallarta are supplied fresh fish and oysters from Tehuamixtle. One would wonder why more tourists have not discovered this charming little place. For many years Tehua could only be reached by water or a poor road from the south. Today, Tehuamixtle is no longer isolated, with easy access by road from El Tuito. In fact the road is in the process of being surfaced. A project that started over four years ago and is nearly finished. 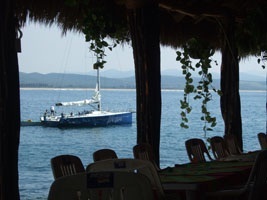 When you visit Tehuamixtle, you should plan on having lunch at one of the three beach restaurants. Food is similar at all three, lots of seafood and oysters, however each has a little different setting. Check them out and pick your favorite, order some drinks and food, and settle in to a leisurely afternoon that only Tehua can provide. You may not want to leave. If you are having too much fun, you can find a room there or nearby. This gem of a place is worth putting on your to visit list. It reminded me of a Mexico past when I fist discovered it and I fell in love with it.